“Once you’re a Lancer, you’re always a Lancer”. Kevin Crosby is a well-known horseman and has had a very successful show career but did you know that he got his riding start at Lancers? We are so fortunate to count Kevin as one of our Lancer alumni! Kevin began riding at the Lancers beginner camp in Windsor with Mark Facey (1960s) and then continued to ride at Lancers throughout his youth and even up until his second year of university. Kevin remembered Facey (who had been in the British military) as strict but as a good instructor. In fact, it was the good instruction he received at Lancers that is prominent in Kevin’s mind. He recalled that another instructor, Captain Anthony Zato, gave him a great foundation in flat work and made sure that Kevin always succeeded at his flat work before moving on to any jumping. It was very interesting to hear how Lancers used to run back in those days and see how, despite the decades that have past, there still remains the same essence of hard work and what we would now call “peer-mentoring”. Kevin noted that at Lancers, younger riders were matched with older youth riders who would be responsible for their younger charges. This included leading (or ponying) the younger riders around and making sure the younger riders’ horses were well turned out and correctly tacked up. “It was great for the older kids”, Kevin noted, “because it taught them responsibility and it was part of that system”. Even today, Lancers functions in a way that older riders still, both altruistically and sometimes with a bit more structure, help the younger riders. In his youth, Kevin would be at the stables every day, especially when he attended the Queen Elizabeth High School. He also began teaching lessons at Lancers when he was 15 and got to ride the green horses from out west and “had a lot of fun getting on them”. Kevin explained that everyone at Lancers still had to do Musical Ride practice even though it was becoming quite the show barn. Other excitement came from being able to ride in Point Pleasant Park! Not only did they get to break out into a steady canter but apparently much fun was had jumping park benches and picnic tables in the park! From this, we get a glimmer of just how much the Lancers were present across the city of Halifax. Kevin also recalled standing guard at the gates on top of Citadel Hill. In fair season, he explained, two Lancer horses would stand on horseback; all the visitors enjoyed patting and seeing the Lancer horses. It surely provided a nice view of the harbour and there was even a front-page newspaper photo of Kevin on Ebony and Kathleen on a horse called Legion. Ebony, a black pony from out west, was actually the first horse that Kevin showed. “Ebony was” according to Kevin, “hard to ride and hot as a pistol” but by the end of the show season with a lot of perseverance, they were winning! From this experience, Kevin learned that “it is harder to win. If you win easily, it doesn’t count. It’s when you have to bite the bullet to win that it is important”. A pony called Cicero was Kevin’s favorite Lancer horse because he was “his buddy” but he had to move on when he got his own horses at Lancers (Pan Am and Talisman). He showed them in the junior jumpers and then the open jumper division. It was wonderful to hear Kevin say that Lancers greatly influenced his riding career: “everything came from Lancers when I was a kid. I had a terrible bug for horses anyway but Lancers allowed me to express it and they got me to a level where I could compete across Canada and the US”. 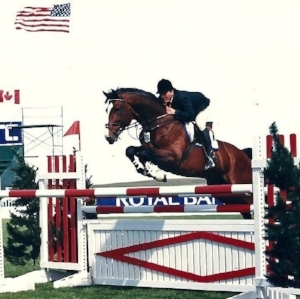 Kevin most certainly went on to have many notable achievements including competing on the Grand Prix circuit in Canada, being second on the talent squad in Canada, and competing at Spruce Meadows with Buntspecht. Unfortunately, he didn’t get a chance to compete at the 1980 Olympics in Moscow because Canada and other countries boycotted the games. Kevin also showed Regarde which was one of the first corporately owned horse in Canada and was owned by Coca-Cola. He also showed Fantast, who sired many successful show horses on the maritime show circuit. The horse bug must have been passed on to the next generations as Kevin’s daughter is a veterinarian Calgary and his son is a Grand-Prix rider in Ontario. Despite all Kevin’s success, he has made sure to give back to Lancers over the years. He and Ross Ainsley, our vet at the time, were responsible for bringing over the legendary Latvian horses to Lancers in the late 80s (we’ll return to that story another time). Many other Lancer school horses have also come from Crosby Stables. We greatly appreciate these contributions and we were very pleased to hear Kevin say, “once you’re a Lancer, you’re always a Lancer”. We couldn’t agree more and we are happy to count you as one of our Lancer alumni!